When you are decorating your pizza shop, or redecorating it, you will want to make sure that you choose something that works well for your type of pizza shop. Of course, this is going to be different for different shops and owners -- otherwise, all pizza parlors would look the same. In fact, similar décor is one of the problems that many shops face. You have many different options when it comes to choosing your décor. Find the one that you think will work best for you and your patrons. Here are just a couple of examples you can try on for size. If sports are big in your locale, then you might consider creating a pizza shop with a sports theme. You can decorate your pizza shop with sports memorabilia; have your staff wear sports uniforms or hats; and invest in a couple of big screen televisions. In this way your patrons can order a few slices while watching their favorite sports game in an environment filled with sports decorations. You can also try naming some pizzas after the local sports team. 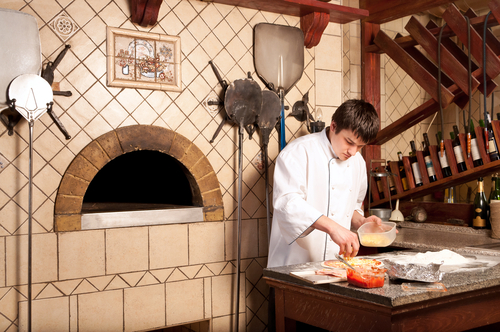 Even though it might seem cliché, you really can’t go wrong with maintaining a traditional look to your pizza parlor. Use such items as red and white checkered tablecloths, napkin dispensers, condiment caddies and other traditional accessories that will give your shop a homey feeling. Traditional décor does not have to mean boring – it can also mean classic. You could forget the traditional and look for some eccentric and eclectic décor. Having some unusual but interesting décor in your shop can help you develop a certain look and theme for your pizza shop. Try the web to find many interesting ideas for décor that is way out of the box. Another option would be to go retro and create a pizza parlor that takes your customers back to the past. You could decorate with a 50s or 60s, theme. You can look for this type of décor at garage sales or online to find just about everything that you would need to create a vintage look. If none of the above options above seems to fit what you are looking for, don’t worry there are still more options available. How about a theme for your shop based on the shops location, or based on a certain vocation, hobby or interest. These ideas are often fun for your clients and don't require a large outlay of money, so they can be changed every month or year to keep things interesting. When you think about décor, you should consider more than merely the visual. When you think about walking into the pizzerias of your youth, think about the way that they excited your sense of smell. Since you are making pizza, you won't have any trouble creating the perfect scent for your shop, but also consider the sounds, feel and comfort of pizza places and the happiness and excitement they can exude.